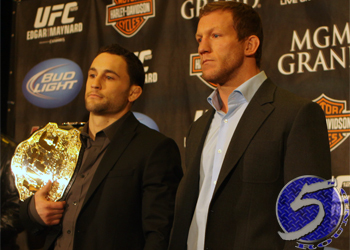 UFC lightweights Frankie Edgar and Gray Maynard completed their trilogy in the main event at “UFC 136: Edgar vs. Maynard III” on Saturday inside the Toyota Center in Houston, Texas. Edgar put his title on the line against Xtreme Couture’s star for the second time and survived another opening round onslaught. Things were looking grim for “The Answer” after Maynard landed a devastating uppercut only minutes into the 1stRound. Maynard was much more composed this time around, hoping to not gas out as he did in their rematch at UFC 125. Unfortunately for the challenger, he allowed the champ to gather himself too much and find his rhythm. From there, Edgar never let “The Bully” get going as he outboxed Maynard the rest of the way. Edgar used his superior hands and speed to keep Maynard flat-footed until he landed an uppercut of his own that spelled the end for Maynard.